"DC Nation" used to be a weekly column in DC comics. Now, it's a once-a-month promotional magazine. Issue #2 came out last Wednesday, and it featured this ad for Heroes In Crisis. Which THREE of these characters will be accused of murder? Which TWO of these characters will be murdered? Which ONE of these characters will be revealed as a murderer? 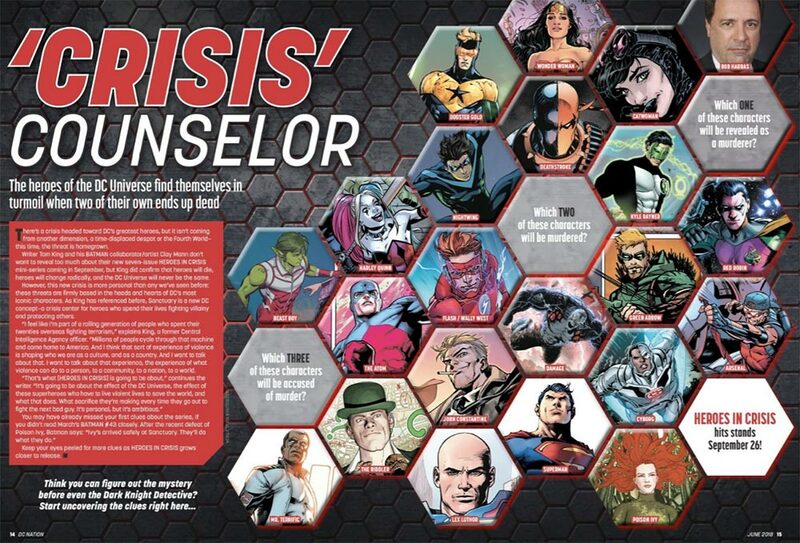 The characters we get to choose from are Arsenal, Atom, Beast Boy, Booster Gold, Catwoman, Cyborg, Damage, Deathstroke, Flash (Wally West), Green Arrow, Harley Quinn, John Constantine, Kyle Rayner, Lex Luthor, Mr. Terrific, Nightwing, Poison Ivy, Red Robin, Riddler. Superman, and Wonder Woman. I'm not sure how surprising this is supposed to be. Two of the three accused (Booster and Harley Quinn) were revealed in the initial series announcement. Several of these are already known murderers. So the biggest question might be who's going to die? Our fingers are crossed, Booster Gold. Why do you hope Booster gets murdered? Seems a bit odd for a Booster Gold website. If Booster Gold had nine dollars and earned ten more, how many dollars does he have in all? If there were ten villains, and Booster Gold defeated five of them, how many villains remain?